Hydronium Eurorack voice module: new from Rare Waves! Posted on February 17, 2019 | Comments Off on Hydronium Eurorack voice module: new from Rare Waves! Rare Waves Hydronium analog synthesizer is now available in Eurorack format, as a DIY kit ($225) or pre-assembled ($359). Hydronium is a high quality electronic music instrument with “the works” – MIDI and CV-Gate control + semi-modular patachability. Its great tone and playability will invite you to stay up late making tracks! Comments Off on Hydronium Eurorack voice module: new from Rare Waves! The Drone Commander 2 Standalone is now available in custom tolex color finishes! We’ll soon be offering the Grendel DC-2e Drone Commander 2 in a standalone format. It comes with a custom fitted Eurorack case. The case features a removable lid, tolex vinyl covering, and convenient power supply. Orange and black finish are standard options; custom colors available by request. Synthesizer demo with Grendel DC-2e Drone Commander 2 Eurorack and Grendel RA-9 Grenadier. Two tracks of DC-2e, one track of RA-9, plus a touch of mystery synth. Grendel synthesizers are available from I/O Music Technology, Detroit Modular, Switched On, NoiseBug, Perfect Circuit Audio, Analogue Haven, Noise Kitchen, and SchneidersLaden. Demonstrating some sounds you can get with the Grendel DC-2e Eurorack voice modules, and the Grendel RA-9 Grenadier. And a third, mystery synth! 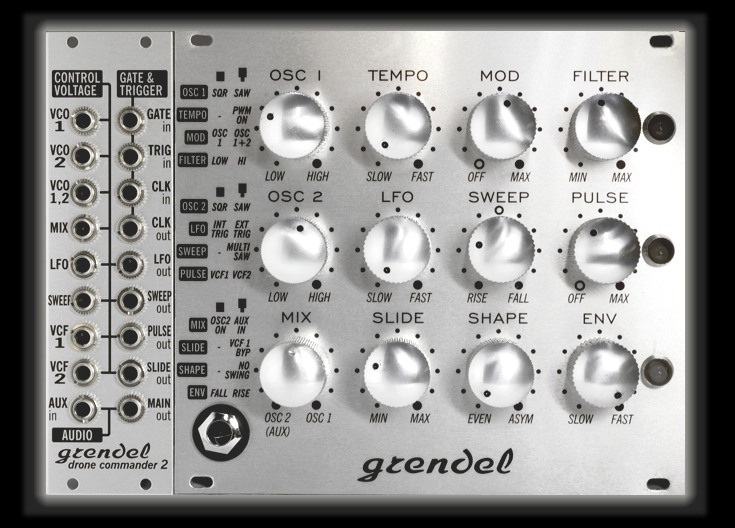 Grendel synthesizers are available from I/O Music Technology, Detroit Modular, Switched On, NoiseBug, Perfect Circuit Audio, Analogue Haven, Noise Kitchen, SchneidersLaden. This video walks through getting started with the Grendel DC-2e Drone Commander 2, beginning with using the Main Module by itself (0:30). Next, see how to control it from a MIDI keyboard, using the Expander module and a MIDI-CV converter (3:40). A self-patch that gives additional filter modulation is demonstrated (5:35). After that, one of the MIDI-CV converter’s auxiliary CV outputs is patched in to control DC-2e’s LFO rate with the MIDI mod wheel (7:00). The next section demonstrates VCF 1’s self-oscillation (8:35), including how to cancel the filter’s self-oscillation so only the dry tone of the VCOs is heard (9:50). Then, VCF 1 is set up as a third oscillator, creating a constant-pitched drone note to accompany melody played on the VCOs (10:50). Last, some examples of pitch modulation using the MOD knob are shown (11:40), leading to full-on crazy town. 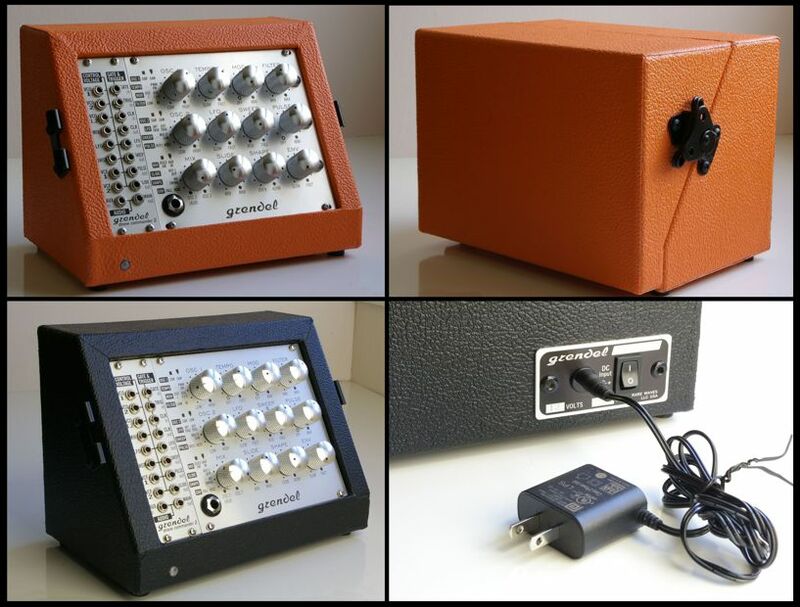 Europe/UK: SchneidersLaden has Grendel DC-2e! Rare Waves LLC demonstrates a Grendel Drone Commander 2 prototype in Eurorack format. Drone Commander 2 is a true analog synthesizer with discrete transistor technology. It has 12 knobs for lots of hands on control, and every knob is a push-pull switch for lots of tone modification options. It retains the original Drone Commander filter, and adds a second independently controlled filter for contrast. The second filter is a smooth and clean 4-pole lowpass filter (-24dB/oct VC-LPF). It has an attack-release envelope generator and serves as a lowpass gate, to control the volume and tone. The optional Expander module can be connected for extensive voltage control. It has 18 patch points including CV/Gate input, Clock in/out, and external audio input. Connecting a MIDI controller and MIDI-CV converter to the Expander gives the Drone Commander 2 its full potential for melodic control, sequencing, and synchronization.